Usually, when I interview someone, I like to keep it professional, ethical and maintain my integrity. It’s mostly just an animated-ish conversation (because that’s how I speak – in a sing-song voice) and I get straight to the point. Even if I admire the person, it’s just a few subtle words of adulation and it’s back to business. But ALL my principles went tumbling down the drain when I met this guy. 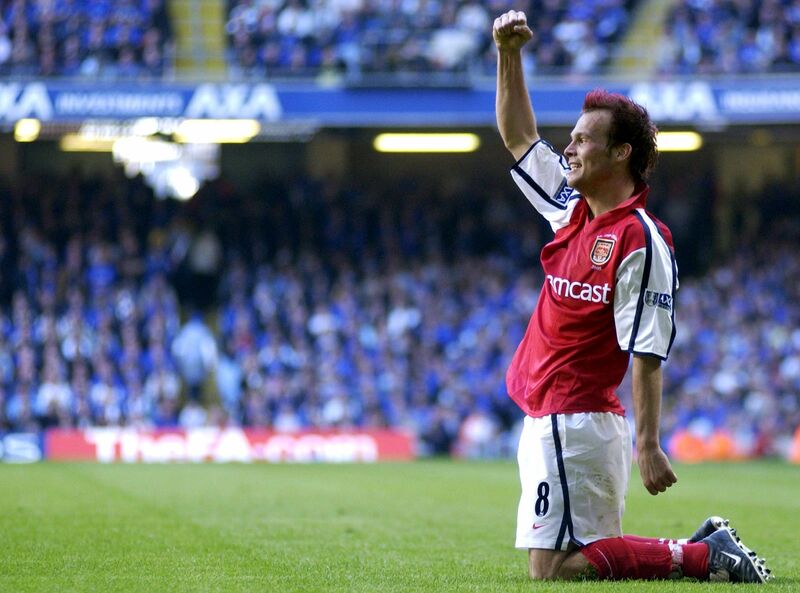 Freddie Ljungberg. (For those of you who don’t know him, he played at Arsenal for ten years, during the era of The Invincibles, the team went 49 games unbeaten.) Honestly speaking, I hadn’t seen him play much, because I didn’t follow football until five years ago. When he played in the early 2000s, I was still supporting the Italian national team simply because Italy made pizza. Yes, I’m touching one of the Invincibles. Anyway, let’s not discuss that. 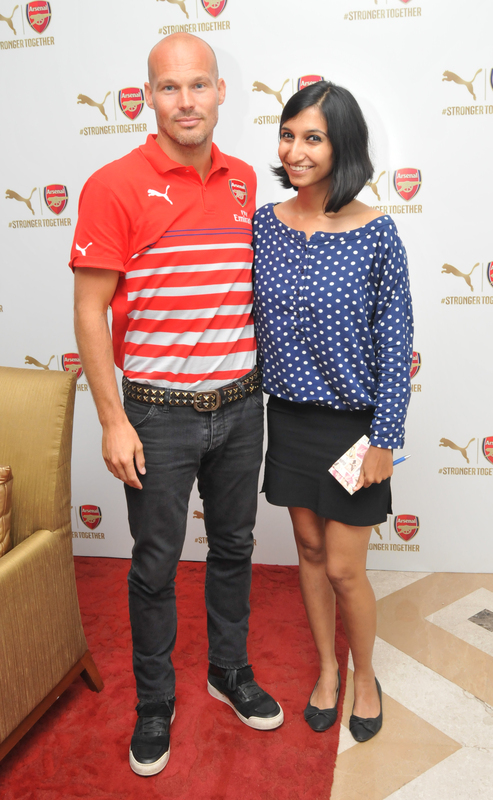 When I heard of this AFC Tunnel of Time event that Puma was organising to launch Arsenal’s new kit at UB City, and that it was exclusive to invitees only, I knew I could pull a few strings and get to the event. Little did I expect to get an exclusive interview with Freddie! I hyperventilated all the way to the room where the interview was going to happen. Initially, I had made pages of questions, and after the press conference, I realised that most of my questions were already covered. So, hurriedly, with the help of my friends, I made new questions and went to him with seven pages of notes and questions. I was ushered into the room along with two other journalists. I had expected a one-on-one, but I didn’t care. I wouldn’t argue with the organisers, lest I jeopardise my opportunity to meet Freddie. So I walked in, made myself comfortable and waited for him. The first glimpse I caught of him, was in the form of his reflection. The dark glass walls of the room showed me a tall-ish figure walking towards us in calm strides. Then his real form appeared in front of us, modestly apologising for making us wait. “I’m so sorry I had to make you wait. Hi, I’m Freddie Ljungberg,” he said and shook hands. I couldn’t stop grinning. Throughout those 10 minutes I was with him, I felt like everything was happening of its own accord, but somehow going my way. Me: Did you expect the crazy crowd out there? Freddie: No, you never expect anything. It’s always nice to see support. I’ve been working as an ambassador for Arsenal for a while and have been travelling around Asia. It gets crazy sometimes with 5,000 people waiting at the airport. So you never know what’s going to happen. I hope they had the good time I had; I’m really happy. Journalist 2 and 3: Why exactly did you decide to promote the Indian Super League? Freddie: I’m trying to give the sport some publicity in the country. Ever since I retired, I’ve been asked to do a lot of training and promoting work in many countries, but in India, I felt there was a real passion behind it. I see proper interest in the country and lot of young talent. Back when I was in Arsenal, there were 14 different nationalities in one team and I felt there is so much to learn from each country as a human being. It’s great for me to be here, because I get to learn as much. Me: How would you compare club football and national football? What do you enjoy more? Freddie: When you play for a club, you play everyday and the team is much better. When you’re missing a left back, you can just look around, find a left-back and buy him. (Laughs, and I giggle). When you play for a national team, however, if you don’t have a great left-back in your country, you have no choice. Besides, you meet just five days and you leave. But the honour while representing your country is unmatched. When you’re 15 years old, and you play for the national team, you have goose bumps when the national anthem is played, it’s an amazing feeling. Journalist 2: So how is the current Arsenal squad when compared to The Invincibles? Freddie: I don’t like to compare them. The current team will have a lot of pressure because we won so many titles in the past. They have started with the FA Cup again and I’d like for them to keep that going. Besides, there was the construction of the Emirates stadium in between, which put a financial constraints on the club. That’s when we supported them, we were all together. Last season, we spent a lot of money, we bought Ozil, I can only see the club getting better now. Me: Alright, I’m going to rewind a bit. What made you take up football? When did you first kick the ball? Freddie: Oh! (Laughs and looks reminiscent) My father played football and my mother also worked back then. So my dad used to take me with him and park next to the football field. The kit-man looked after me; he changed my nappies while I sat watching my dad play football. I think… My parents always told me that from a very young age, I always loved balls. Even when I couldn’t walk, I was always calling after the balls from my dad and stuff like that. It came naturally to me. It’s a funny story actually. When I was five years old, my parents wanted to move to a bigger city, because my dad got a job. They asked me about it, (of course it wasn’t up to me, but they were just being polite (laughs)). They asked me if I’d be okay with it, and I said, “Only if you take me to a proper football club.” So they took me, and I was in a club when I was five, when other kids usually start at 6 or 7. So that’s how it started. Me: So you were a demanding kid, huh! Journalist 2: So whom did you consider your inspiration? Freddie: A lot of people have inspired me. My mom and dad of course. My dad played football, so we spoke about football a lot at home. I managed to have a great coach when I was young, which is why I was talking about how important it is to learn good fundamentals at a young age. Then of course, I’ve had managers like Arsene. He has had the biggest influence because he’s been my main coach and I have been under him for 10 years. He taught me a lot. Sometimes, back home, a lot of players got arrogant as they grew popular, but Arsene always taught us to be humble. It’s one of the things I love at Arsenal. He taught me to treat everyone equally. It’s something he left behind. Me: If you hadn’t joined Arsenal when you did, which team would you have rather joined? Freddie: It’s hard to say, really. When I was 16, I said no to Bayern Munich. When I was 18, I said no to Barcelona. I didn’t think I was ready. Arsenal came up, and so did Juventus and another team. Finally, my agent decided that I was ready to leave the country and play in Europe. But that was a hard decision. In Sweden, you don’t earn any money at all, and in Europe there’s a lot more money. But with my parents’ advice, I moved to Europe. I joined Arsenal and stayed there ten years because I didn’t want to go anywhere else! Me: Weren’t you tempted to join any other team in between? Journalist 3: What about now? What are you planning to do in the future? Freddie: In my life? (Laughs) I’ve been asked quite a lot to do managing and stuff. But I’ve got a young family so I don’t want to take that up yet. Right now, I’m Arsenal’s ambassador, so I have to travel the world, meeting mayors and politicians. So I do that, and I work with Puma, so all these things keep me busy. Journalist 2: Do you plan to remain in the field of football or do you ever see yourself out of it? Freddie: My father worked with buildings, and it’s a passion for my family. So I build buildings now and I really enjoy it. Me: Well, speaking of off-the-field, are you still modelling? Freddie: I never do modelling. (Hearty laughter). But yeah, I work with a few brands, and it works well for both parties. It’s something I’ve been doing my whole life as it came with my football abilities. They thought I was a good match for their brand, and yes I do some modelling! Me: Does it come easily to you? Especially the Calvin Klein shoot? Freddie: No. (Laughs again.) It took them three months to convince me to do it. I was like “Pose in my underwear? No chance!” But they convinced me and made me comfortable and I did it for four years. It worked well and the pictures turned out well. But it was something I was really nervous about. Me: And how have you managed to stay fit, considering you retired a couple of years ago? Freddie: I do martial arts four times a week. I enjoy it; the reason behind that being, as a player you miss that buzz you get when you walk out to a full stadium and feel the adrenaline kicking in. In my opinion, when you do martial arts, sparring against someone who wants to hurt you gives you that adrenaline rush. That’s why I started it and it keeps me fit as well. Freddie: It does get hectic, but when I played, I travelled a lot more, almost three times a week. But as a footballer, that’s how you live. Now I’m home much more than I used to be. I go ten days on Arsenal trips and stuff, but in general, I’m home a lot more. Me: This is a highly hypothetical question. If Henry manages the team someday in future, do you think you might coach along with him? Freddie: We’ll see. I’ve been adviced by other managers not to be an assistant and be a coach who gets to make his own decisions. So it depends on the circumstances I suppose. Me: Alright, right now, who do you think is the player that plays most like you? Freddie: Ooo! It’s hard to say. I got a lot of messages on Twitter after the Community Shield saying Sanchez played a bit like me. I would say, a mix of Sanchez, Walcott and Rosicky would constitute a game like mine. Me: What would you say was your strongest quality as a footballer? Freddie: Oh! You have to get better at everything, but when I played, I would say my vision – reading the game. I had quick feet and my technique was probably my strength, which is very important. Me: So what would your advice to young footballers be? Freddie: I don’t know if it’s a big debate in India – if you should work on physical or technical skills as a kid. Personally, I think it’s important to work on the technical skills. There are a lot of kids, myself included, who are really small when they’re kids. When I was playing for the national team at 15, I was rather small and not built. I worked only on my technical skills. By the time we all turned 19, the players who had worked on the physical bit were not selected at all, because they were strong and powerful but had no technical abilities. So it doesn’t matter whether you’re built. That will come naturally later on. But it’s difficult to start training for technical abilities when you’re 18. So, that’s that. For me, it was more about meeting him and getting the many jerseys and scarves my friends had given me signed. The interview was a bonus. I haven’t put down the mainstream questions from the press conference here. For that, you can read this article, which has articulated the whole event well. This was my first BIG interview and all this had to be done in under ten minutes with other people in the room. But I’d say I was quite confident throughout the interview, contrary to my beliefs before I started speaking. Maybe Freddie just had a calming aura around him. Or maybe I was buzzing because I had just met an Invincible. I’m still reeling with excitement thinking about it. I was beside myself yesterday, squealing in delight at everything! I’m really thankful to Puma for bringing Arsenal to all us Gunners. We waited for the drought to end, and suddenly it’s all coming crashing on us, the FA Cup, the Community Shield, this. Well, it’s all a part of being a football family, I suppose. You win some, you lose some. Thanks again, Freddie, for making my career, my profession, my blog, and my life more meaningful. 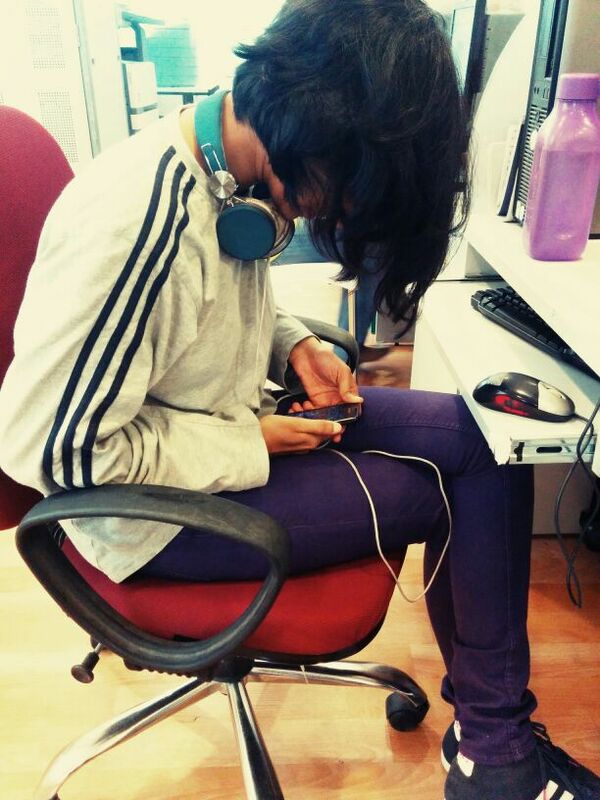 Anyway, just because I wear tshirts and jeans and sneakers all the time, it doesn’t mean I don’t care about myself. In fact, a few people would laugh if you said “Swathi doesn’t care about herself.” I can imagine Nuvena laughing already. She is the one who gifted me a Mephobia print out to pin up on my desk. I might have mentioned it before. Mephobia is the fear of becoming so awesome that the world can’t handle it and it explodes. Or something to that effect. But loving yourself comes with a few clauses. Also, you can tell from how a person expresses love for himself, whether he’s a selfish jerk, or whether he genuinely loves himself and everyone around him. At least from my experience, I understand that if a person is always speaking ill of others, dismissing others opinions and feelings, and thinks his way is the right way, then he’s taking the wrong route. He probably doesn’t love himself at all. He is probably convincing himself that at least someone loves him, because nobody really does. The best way to go about it, is be straightforward about it. In office, when I hand over an edited copy to my editor, who reads it again and finds zero errors, I’ll say “Wow! No errors? So cool!” (There are usually at least ten errors on an edited page.) I give myself that much liberty to praise myself, simply because I know I’m good. It’s going to cause no harm, save perhaps an amused look on my editor’s face. Everyone in my office thinks I’m narcissistic. However, that isn’t the right word to use. I just love myself. My dad is another example about how to go about it. The world knows he loves himself. He loves having pictures of himself clicked. He’ll even tell you that he’s awesome and tell us stories about him being awesome in his childhood. That’s a healthy amount of love for oneself. At the same time, he’s also the most selfless person, helping other people at the drop of a hat, sympathising with everyone. Pretty much like my mum. She doesn’t expect anything from anyone. She’s such a peaceful, fun loving person, and I’m so much like her. She has just taught me the art of happiness in the most subtle manner. That’s the thing. You have got to learn to be self sufficient. You have got to find a way to be subtle and loud about your love for yourself. You have got to find that balance. Then you’re set. Because if you don’t love yourself, how can you expect others to love you? PS: If you have noticed that I used too many brackets in this blog post, it’s because I learnt this today.